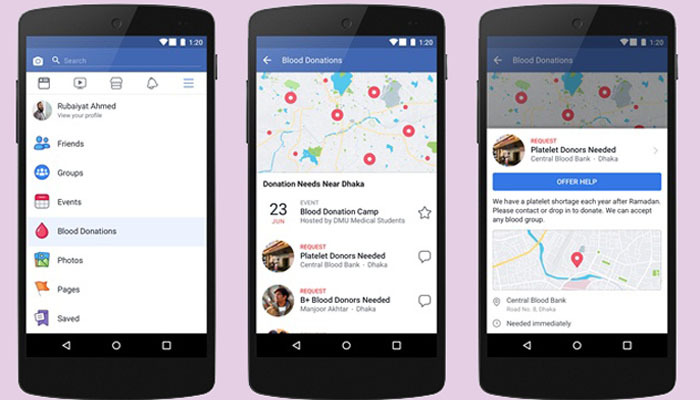 In honour of World Blood Donor Day on June 14, Facebook is launching Blood Donations, a new center where people in Bangladesh, Brazil, India and Pakistan can find opportunities to donate nearby. “We are also running a campaign in these countries to raise awareness of blood shortage and the importance and impact of donating,” said Facebook in a press release on Tuesday evening. People who visit Blood Donations on Facebook can also sign up to be a blood donor to get notified directly when there is a need for blood nearby. To date, more than 10 million people have signed up and thousands of donations have been facilitated through Facebook, the press release said. “We know that when donors have information and opportunities to give, they step up to help. But often donors don't know where and when to donate. Blood Donations on Facebook shows people opportunities to donate in their city, including nearby blood donation events, requests for blood donors and blood banks,” it said. “We have also made it easy for organizations to add requests and events to the center. People will be able to access Blood Donations on Facebook from the explore menu on their device,” it added. In many countries, including Bangladesh, blood donations are typically at their lowest during May and June. To help raise awareness of the shortage and the need for donations, Facebook will be running a campaign through the month of June to encourage people to donate blood, share stories of people who have saved lives using these features, and educate people about the process of donating blood. Our blood banks thus face an urgent need to collect blood through repeat donations from our regular donors and also by recruiting (and retaining) more new donors to ensure replenishment of blood stocks from a low-risk population to maintain the smooth functioning of the system, the Facebook press release said. The Facebook hoped that by raising awareness and letting people know where and when they can donate, we can increase blood donations and contribute to a more sustainable blood supply.